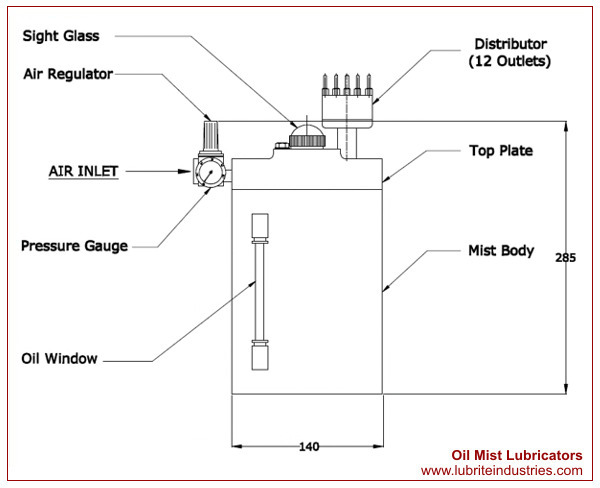 Oil Mist Lubricators: Lurbite Industries is an ISO 9000:2001 Certified Company an exclusive manufacturer, supplier and exporter of the finest quality of Oil Mist Lubricators. We also manufacture Cusomised Centralised Lubrication Systems, Deluxe Lubrication Units, Electronic Timers, Electronic Controllers, Metering Cartridges, Junction Blocks, Fittings (st. connectors, Elbow Connectors, Banjo Bolt assembly, D/E connectors, Clamps, Tubings, Planning/ Installation of the system. Single Line Lubrication Pumps, Manual Grease, Pumps, Automatic Dual Line Lubrication Pump, Dual Line Dose Feeders. From 01 outlet to 12 outlets models are available as per the requirment. Mist Body Reservoir Capacity= 3 Ltrs.